He’s been portrayed in the mainstream media as a "narcissist," a scheming "traitor," an agent of Russia, a Chinese spy, a clueless high school drop out, an anti-government "extremist," and I’m quite sure I must’ve missed a few of the more exotic epithets. I’m talking about Edward Snowden, of course, the former CIA employee and NSA contractor whose leaking to the Guardian has exposed a vast global spying apparatus secretly constructed by Washington. The weeks-long Hate aimed at Snowden reached its apogee when prominent "journalists" started going after the reporters who broke the Snowden story, principally Glenn Greenwald and Laura Poitras, inferring that it was Greenwald and the Guardian who put Snowden up to penetrating the NSA. These aren’t just wingnut bloggers we’re dealing with here, but two prominent legacy-media reporters: David "Meet the Press" Gregory and Walter Pincus, of the Washington Post. When Gregory demanded to know why Greenwald shouldn’t be prosecuted alongside Snowden, that was the Establishment baring its teeth. "American voters say 55 – 34 percent that Edward Snowden is a whistle-blower, rather than a traitor, according to a Quinnipiac University national poll released today. In a massive shift in attitudes, voters say 45 – 40 percent the government’s anti-terrorism efforts go too far restricting civil liberties, a reversal from a January 14, 2010, survey by the independent Quinnipiac (KWIN-uh-pe-ack) University when voters said 63 – 25 percent that such activities didn’t go far enough to adequately protect the country. Almost every party, gender, income, education, age and income group regards Snowden as a whistle-blower rather than a traitor." This poll tracks several interesting trends, the most arresting of which is the utter unanimity with which the American people are rejecting the Official Narrative on Snowden – that Snowden is a traitor who committed espionage and deserves to be punished for his "crime." Weeks and weeks of relentless smearing, accusing him of collusion with America’s enemies, and worse, have simply had no effect – other than, perhaps, to increase his approval ratings! As was the case in the former Soviet Union, where people took the truth to be the opposite of whatever appeared in the newspapers, the American people are simply tuning out the "mainstream" media. In the upside down Bizarro World they find themselves living in, Americans have resorted to the only reliable method of determining truth from falsehood: by simply inverting whatever the Establishment media is "reporting." 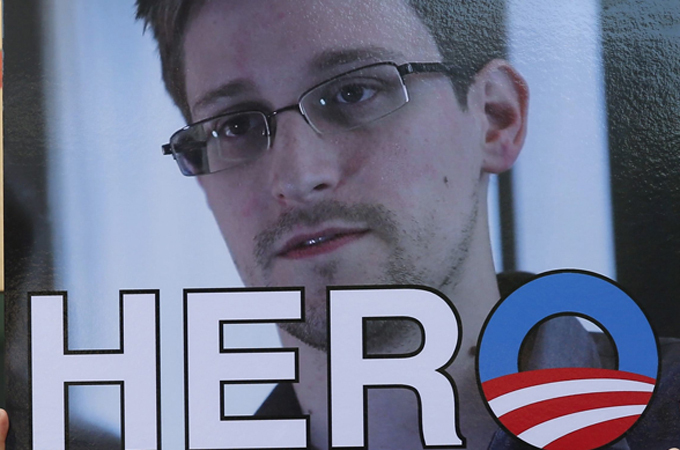 They’re telling us Snowden’s a "traitor": ergo, he’s a heroic whistle-blower. A crude but very effective methodology, one that – if applied consistently – can have some pretty interesting implications down the road. The great shift in voter attitudes toward civil liberties is worth going into specifics: the partisan breakdown is particularly interesting. While 49 percent of Republicans support the NSA’s phone dragnet program, the number rises to 58 percent when we’re talking about Democrats. Opposition is centered in Independents, Republicans, and males. 56 percent of Republicans say the dragnet is too much of an intrusion into privacy, while only 40 percent of Democrats agree. The evolution of American liberalism from a pro-civil liberties stance to one that effectively disappears the Fourth Amendment because Government Is Our Friend is here charted and measured. Yes, you’re right that they might not be telling the pollsters this if a Republican was in the White House, but I would argue this shift was bound to happen anyway. After all, haven’t "progressives" been telling us for years that conservative-libertarian fears of Big Government are just paranoid alarmism? Aren’t Democrats the "Mommy" party, which sees government as the Great Protector – and doesn’t the demographic breakdown, which shows women much more conducive to the Surveillance State than men, tell us where Democratic strategists are placing their bets? Indeed, one is hard put to come up with a reason for liberals to stand with Snowden in an age when "We’re from the government, and we’re here to help" is the leitmotif and motto of American "progressivism." Old-fashioned American liberals never believed in any such claptrap. The Midwestern "progressives" of yesteryear didn’t cotton to centralization, and saw government regulation as the instrument of corporate control as much as a shield against it. They didn’t trust Washington bureaucrats, and although they initially supported the New Deal they turned against FDR when he started accruing more power in the alphabet soup of government agencies set up during the Depression. They stood up during the McCarthy era, when the threat to our civil liberties was almost as great as it is today, and they fought government repression tooth and nail. Today, that noble tradition persists in the ACLU, and a few other organizations, mostly legal defense groups, but politically the old-fashioned liberals are in decline, as the Quinnipiac poll suggests, with the center of opposition to the Surveillance State shifting to the libertarian-conservative side of the spectrum. In the short term, this is good news for libertarians, such as myself, who have been campaigning for years to convert conservatives to the cause of constitutional government and a non-interventionist foreign policy. The latter is involved, at least tangentially, because the rationalization for universal surveillance hinges on the need to protect us from the consequences of our dangerously wrong-headed policy of perpetual war. To those of us who lived – and suffered – through the Bush years, that significantly more Republicans than Democrats see Snowden as a whistleblower rather than a "traitor" is an astonishing fact. On the other hand, this is very bad news for the country in the long term. A healthy American liberalism – that is, a movement dedicated to the preservation of our civil liberties against a government ever-eager to infringe on them – is absolutely necessary if the Constitution is to be successfully defended. In the absence of such a movement, it becomes politically impossible to fight off attempts by both the Obama cult and the neocons to impose a universal surveillance regime in the US. Unless old-fashioned liberalism undergoes a revival on account of the Snowden revelations, civil liberties in this country are doomed. Neither the left nor the right alone can save the Constitution: a united effort is needed if we are going to defeat the new authoritarians. I just stumbled upon your blog and wished to say that I've really enjoyed browsing your blog posts. After all I’ll be subscribing to your rss feed and I hope you write again very soon! Appreciate it! This a fantastic internet site. I am so enjoy to read this. This is the type of manual that needs to be given and not the accidental misinformation that is at the other blogs. Appreciate your sharing this best doc. This is article is very nice, amazing and good. nice..